The Royal family found Osborne a peaceful retreat from the public life of Buckingham Palace and Windsor Castle, but it was in use by them for over fifty years, and there had to be provision during their stays for official visits and functions. After the fmily quarters at the Pavilion were completed, Thomas Cubitt, still working closely with Prince Albert (1819-1861), embarked on the Household Wing and the Main Wing of this listed building. 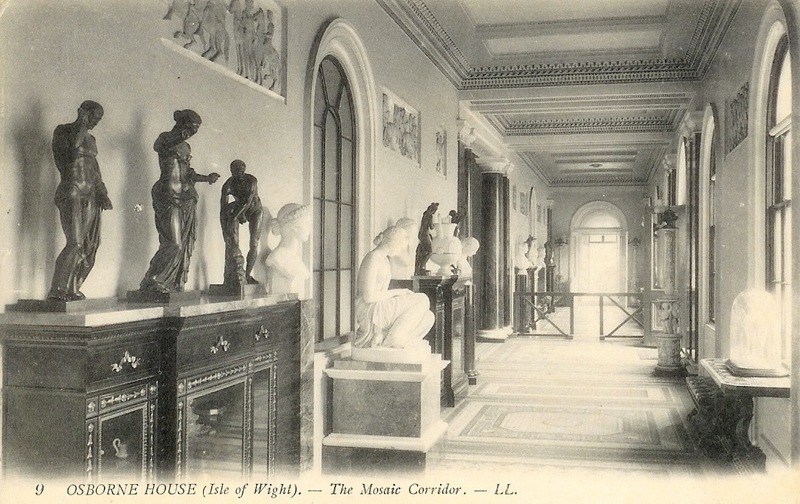 These are linked to the Pavilion by the impressive Grand Corridor, which for obvious reasons has sometimes been called the Marble Corridor or Mosaic Corridor. Well lit from outside, it is lined with sculpture and other artworks, and serves as a gallery as well as simply a passageway. As the point of entry for important visitors, it was intended to make the best possible impression on them, from ceiling decoration to floor tiles, as well as in the number, range and quality of the artworks on display. The Queen's artistic adviser, Ludwig Grüner, was closely involved with the interior decoration here (see Lloyd and Pevsner 45). 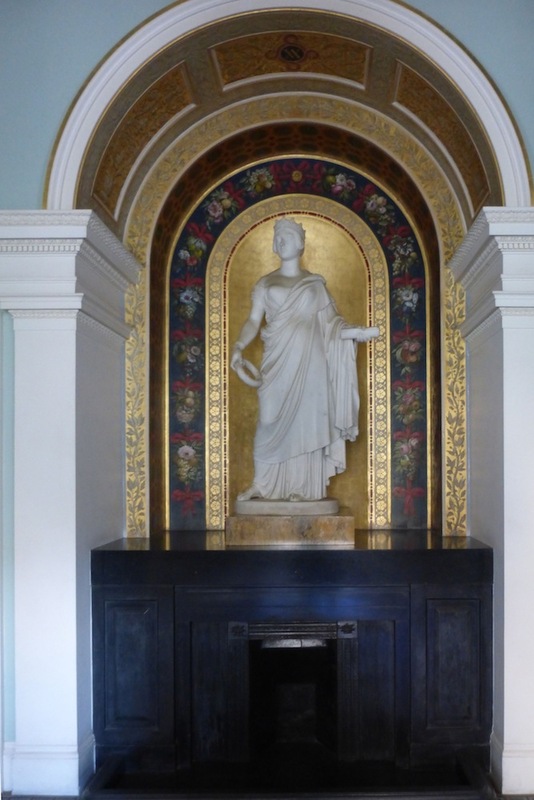 Left to right: (a) One of the alcoves provides a rich setting for John Gibson's sculpture of the Queen herself, c.1847. (b) At the side of the Corridor, on its ornate stand, Guillaume Geefs's touching Paul et Virgine, 1851. (c) On the wall, Catherine M. Wood's Azaleas, c.1880. John Gibson's sculpture of Queen Victoria was a gift from the Queen to Prince Albert in 1849, while Guillame Geefs's portrayal of the two sleeping children, a popular theme in Victorian times, was given by Prince Albert to the Queen in 1851, as Christmas present. The sculpture was inspired by Bernardin de Saint-Pierre's popular novel, Paul et Virginie (1787) about a French girl of noble blood who grows up with and falls in love with a peasant boy on Mauritius (see Marsden 159). 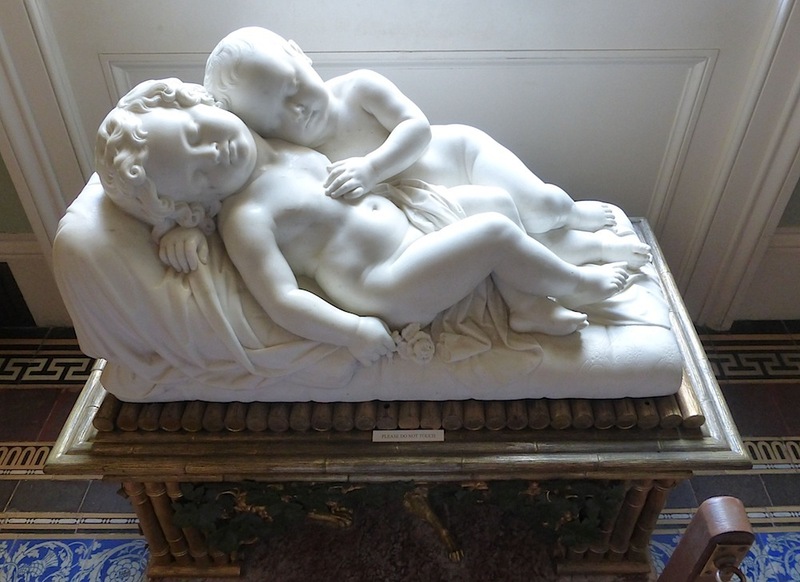 The novel ends sadly so it is perhaps understandable that Gees's work should be compared to memorial sculptures like Francis Chantrey's Sleeping Children of 1816. Visitors would be unlikely to notice that the work has its own special gilded bronze stand, housing the gilded sculpture of a crouching dog, which was added later. 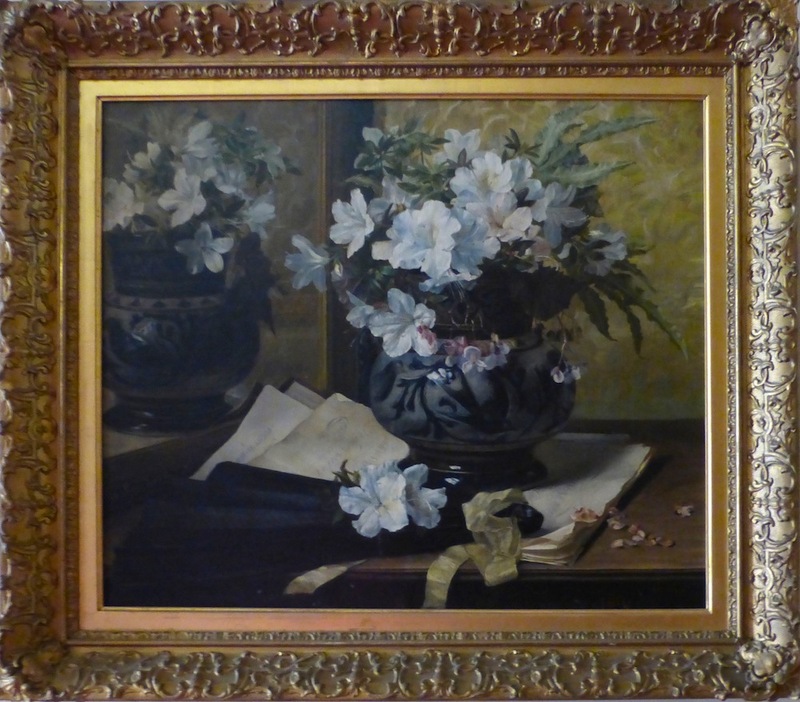 Most works here have a story behind them, but little is known about the painting by Catherine M. Wood (1857-1939), except that the artist had a "long and fruitful career" painting mainly flowers and still life (Gray 287). Two areas of the Corridor's flooring. Left: This shows mosaic-work as well as tiling. 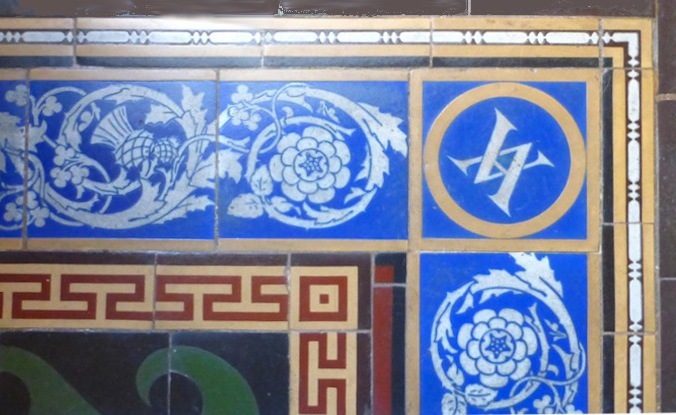 Right: The Scottish thistle and the English rose in this part of the Minton tiling, as well as the entwined initials of the royal couple. Apart from the artworks and splendid decoration (particularly of the ceiling) the Grand Corridor had showpiece flooring, with Minton tiles which were laid in 1851-52. 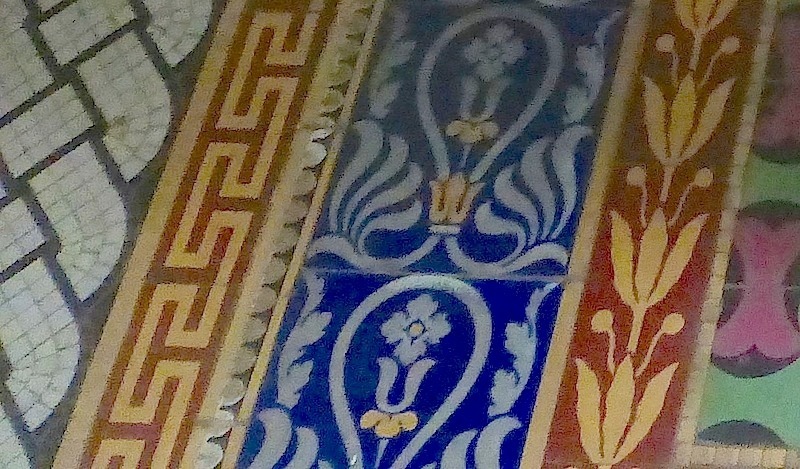 The tiles are thought to have been designed with advice from Matthew Digby Wyatt, and their use in a domestic setting was unusual at this date (see Heard 197). "The royal taste for these floor tiles helped to set the Victorian fashion for tiles in entrance halls in houses across the country" ("English Heritage"). 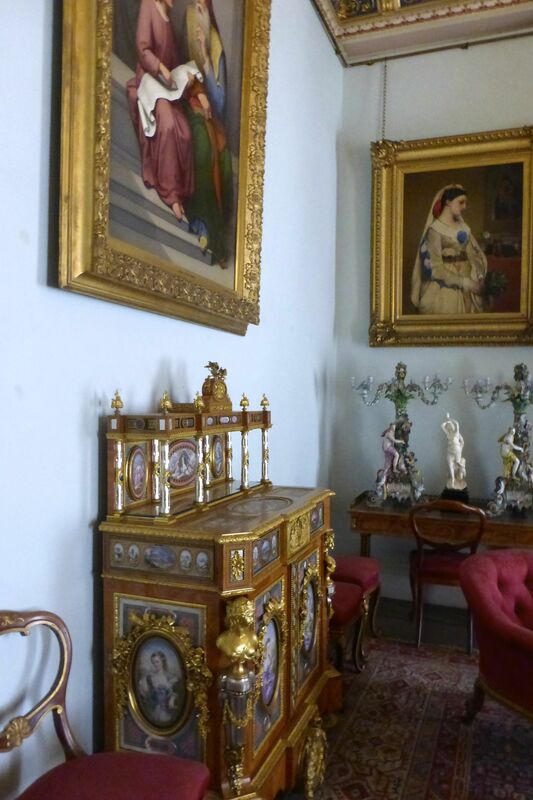 Two views of the room, the centrepiece of which is the fabulous convolvulus and arum lily chandelier. The Grand Corridor gives access to two important rooms in the Main Wing. The first is the more intimate. This is the Audience Room, where ministers and other high-ranking people would be received. 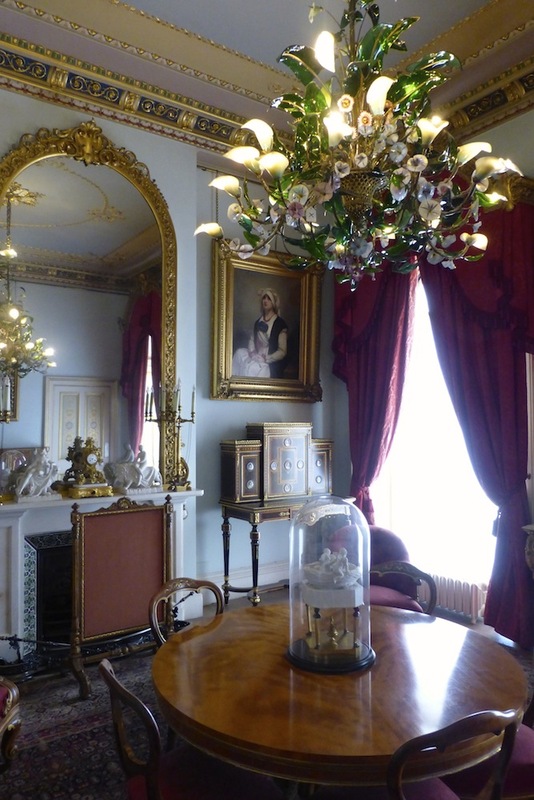 The chairs and writing table are the original ones, and the glass convolvulus of the chandelier is modelled on Prince Albert's favourite flower (Turner 6). 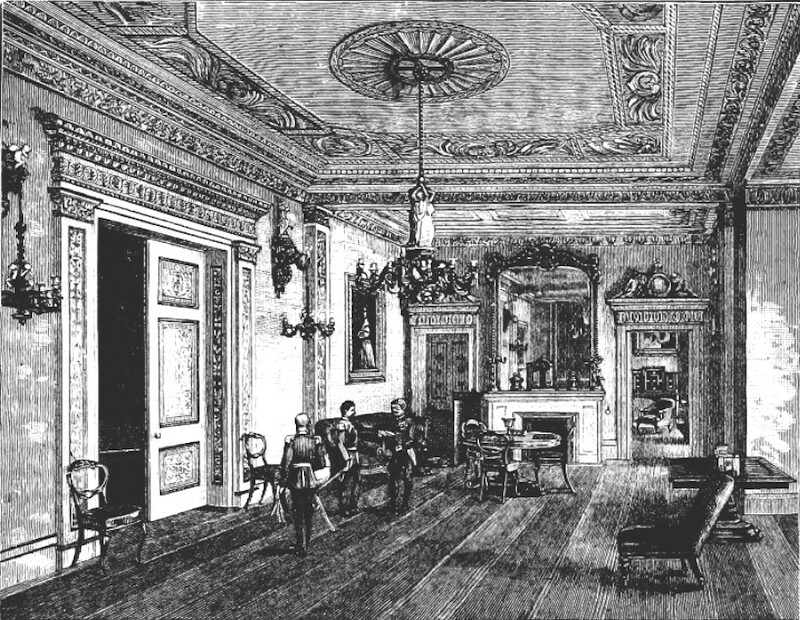 The Council Room, an illustration engraved from a photograph by F. G. C. Stuart of Southampton. Source: Oliphant 260. The Audience Room opens into a larger, more official-looking space — the large, plush, ornately furnished Council Room, in which the Privy Council would meet when the Queen was in residence. It was here in 1857 that the Queen was finally able to give her husband the title that he had long been unofficially known by, that of Prince Consort (see Turner 5; Stewart 51). On special occasions when there were many guests, the Council Room could also used as a dining room, although later on the exotic Durbar Room was used for that purpose. "History of Osborne." English Heritage. Web. 13 September 2017 (this site has an excellent plan of the whole house). Gray, Sara. The Dictionary of Women Artists. Cambridge: Lutterworth, 2009. Heard, Kate. Entry on James Roberts's 1852 painting of the corridor in Marsden. Lloyd, David W., and Nikolaus Pevsner. Isle of Wight. Buildings of England series. New Haven & London: Yale University Press, 2006. Marsden. Jonathan, ed. and contributor. Victoria & Albert: Art & Love. London: The Royal Collection, 2010. Stewart, Jules. Albert: A Life. London & New York: I. B. Tauris, 2011 [Review]. Turner, Michael. Osborne. Rev. reprint. English Heritage, 2016. Wilson, Robert. The Life and Times of Queen Victoria, Vol. III. London: Cassell, 1902. Internet Archive. Contributed by Cornell University Library. Web. 13 September 2017.